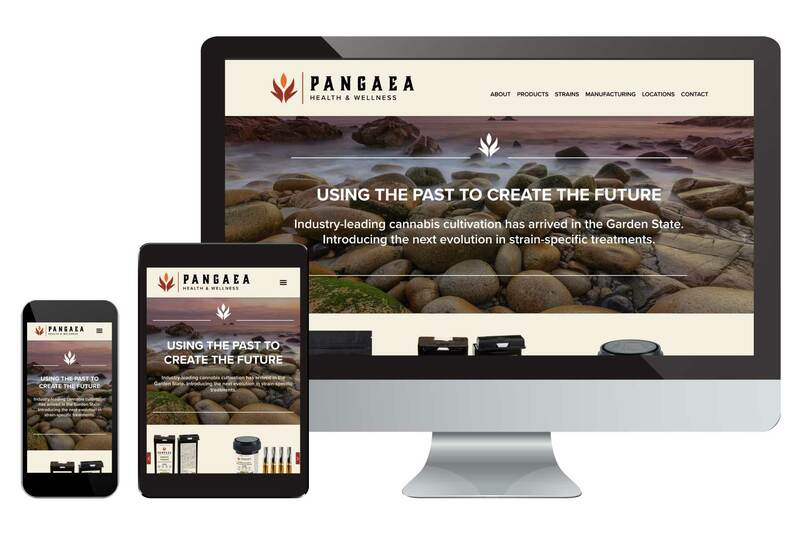 As one of the leading contenders for the few coveted medical marijuana licenses in New Jersey, Pangaea is a vertically-integrated grower, extractor, and producer of high-quality THC and CBD products, and will operate several branded dispensaries throughout the state. Pangaea was under a tight deadline and needed a logo, brand identity, packaging design, and presentation design to accompany their application for a medical marijuana license in New Jersey. After the application was submitted, they turned their attention to developing an online presence with an informational and beautiful website. We were able to quickly develop a logo and brand identity that evoked a phoenix rising, and had the primal, ancient feel that the client desired. Renderings of packaging designs were also developed to be included in the presentation to the licensing regulatory body. Working closely with the technical consultants, we ensured the strict labeling requirements were followed down to the smallest detail, while maintaining the brand identity. We also refined the messaging throughout the website to maintain a friendly and informative tone, without feeling overly casual.